I was asked to write this piece to accompany the MuVi programme for the Oberhausen Short Film Festival music video programme and awards this year. It was a great follow up to being on the jury in 2007, and an opportunity to think of the current big narrative and aesthetic trends in the area. Dynamic flux is the natural state for the music video artform. The TV station with the three-letter acronym that once dominated pop promo culture has been emphatically sidelined to the offline broadcast past, rendered obsolete in an online age where the embed is king. 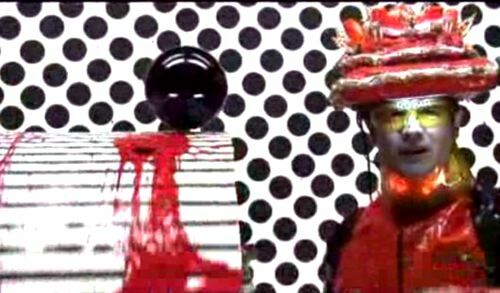 Without a dominating presence channeling us prescribed, sanctioned (and often sanitised) artist clips, it is harder in the music video world to discern any major overriding theme. We’re still going through a transitional phase to a full connection with online video’s possibilities. Music video is having a muted moment. There are no great dominating presences, no great white hopes. The visual blockbusters are few and far between. Motion graphics are not hot. Stop motion feels so last year . CG is out, and slo-mo is in . So does this mean things have finally frayed at the seams? Not at all. Is there anything to get animated about? Of course. A brief flash of neon, and a splash of CMYK may be all we get at the moment in terms of visual trends, but the creative threads directors in the field are currently exploring are still an enticing proposition. I thought it might be Hiyao Miyazaki-esque in its ambitious reach for the fantastical, but after all the hype Bjork‘s latest videoclip, the epic 9-month in the making Wanderlust, washes over you as ineffectually as the river that she travels along within it. Maybe viewing it in high definition 3D might be a revelation, but Encyclopedia Pictura unfortunately don’t reach the heights of either beauty or rawness that are signature elements of the Icelandic artists greatest promo’s. There is no denying the artistry in the piece, and I’m sure plenty of fans will buy the Wanderlust DVD on release, but track and visuals never soar together. Bjork’s videos push boundaries — but in this case I feel it is going in the opposite direction to the leading edge. Video embedded below to make up your own mind, but after the jump compare it to the video for Declare Independence — ok, that video is by Gondry whom it is difficult to fault — but MG shows he’s still the one most in tune with Bjork’s creative flow. Stripped down, like the track: Blue-hued high grunge imagery for Portishead‘s first video Machine Gun from new album, Third. Whether web-cammed or CCD’ed, this is the antithesis of the To Kill a Dead Man promo epic. It catches the moment – we’ve moved on from 16mm noir homages to YouTube rehearsal sneak peeks.